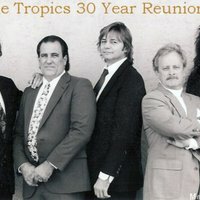 The Tropics, a Tampa-based band, taken on May 7, 1999, for their 30 year reunion show at the Coliseum, located at 535 Fourth Avenue North in St. Petersburg, Florida. The show was a benefit for All Children's Hospital. Original black and white photograph, May 7, 1999: Profiles: Bands & Artists, Tampa Bay Music Scene Historical Society. Digital reproduction of original black and white photograph, May 7, 1999. http://www.tampabaymusichistory.com/resources/15743_215138837836_840642_n.jpg. 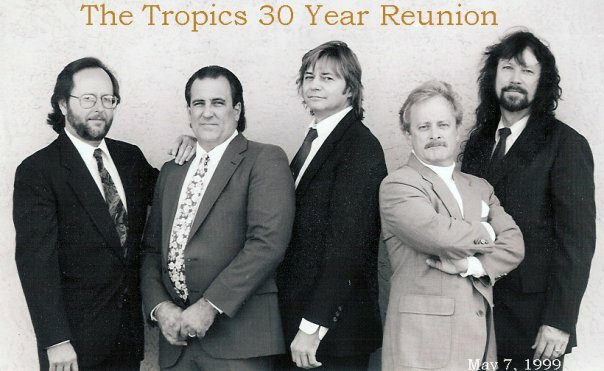 “The Tropics 30 Year Reunion.” RICHES of Central Florida accessed April 21, 2019, https://richesmi.cah.ucf.edu/omeka/items/show/5455.